Full Dolch sight words list grouped by grades (kindergarten: Pre-Primer and Primer; elementary school: 1st grade, 2nd grade, and 3rd grade); each word has flash card, example sentences or phrases, interactive spelling activity, fill in game, and various printable worksheets in both PDF and HTML. Dolch sight words are compiled by Dr. Edward William Dolch, which is based on statistics of reading contents from kindergarten to 2nd grade. This vocabulary is extremely important for young kids in initial words learning. 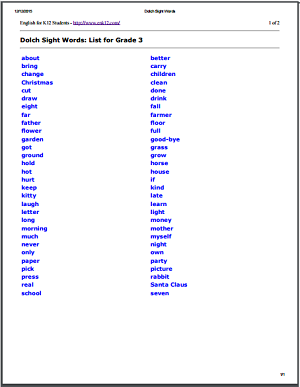 It is also a famous wordlist to be assigned for memorization in American elementary schools. Dolch sight words list actually consists of two parts. At first, this was a list of the 220 most common English words, but no noun was in the list. 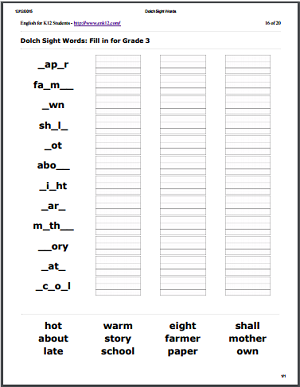 Then Dr. Dolch added an additional list of 95 nouns in alphabetical order, which are the most frequently used nouns in children's reading books. 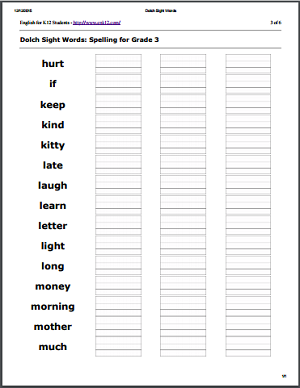 Dolch sight words list provides an excellent base for reading at early age. Between 50% and 75% of all words used in school books and library books, newspapers, and magazines are in Dolch vocabulary. Dolch words list isn't only a workload of 300 words, it's a first step to help kids start their school journey. Because Dolch sight words list was actually based on reading contents from kindergarten to 2nd grade, we strongly recommend to finish all of them before 3rd grade, otherwise more or less kids may face reading issues. For 3rd grade students, we suggest to study Fry sight words list, which is selected from reading contents from 3rd to 9th grade. 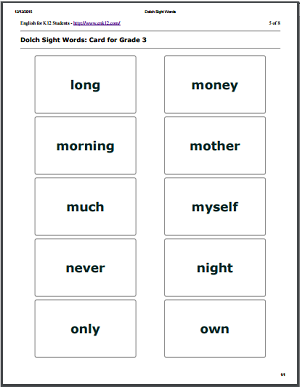 Ideally, Dolch sight words list should be finished in grade 2, although in this app all 300+ Dolch words are categorized into 5 group: pre-primer, primer, 1st grade, 2nd grade, and 3rd grade. (Pre-primer and primer are in kindergarten.) Hopefully, 2nd grade students should complete last 2 groups and study Fry words since 3rd grade. Details of the 5 groups are shown here. This app isn't only to group Dolch sight words list. Do you want to exercise by handwriting? Hundreds of offline worksheets, in PDF and HTML, are available to download and print. This is a great resource to help kids, as well as teachers and parents, get Dolch sight words list in quicker and easier. We demonstrate some fantastic features here; click the picture to enter!